The P8012 can be configured with up to 3 I/O cards. This enables it to support up to 24 high speed analog inputs plus two digital tachos. Alternatively, cards can be combined to provide support for various input options including analog, thermocouple, strain gauge, precision tachometer measurement, CAN-bus, GPS and analog output. Units can be stacked to expand the system up to 96 channels. Read more.. The P8020 can be configured with up to 5 IO cards. This enables it to support up to 40 high speed analog inputs plus two digital tachos. Alternatively, cards can be combined to provide support for various input options including thermocouple, strain gauge, precision tachometer measurement, CAN-bus, GPS and analog output. Units can be stacked to expand the system up to 160 channels. 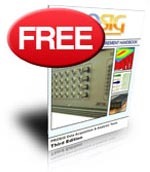 The P8048 is the high channel count version of the Prosig P8000 24-bit data acquisition system. Units can be stacked to expand the system up to 1024 channels. Various input options are available. These include high speed analog, thermocouple, strain gauge, precision tachometer measurement, CAN-bus, GPS and analog output. Read more..
Prolog is a controller that can replace your laptop or PC to allow remote, unattended or standalone operation of a P8000 system. The system may include one or more P8000 chassis. Captured data is accessible simply using a network share via Ethernet. Contains analysis for acoustics including 1/n octave filter, sound power, sound intensity, sound level meter, transmission loss, room acoustics RT60, 2 mic impedance tube and sound quality metrics. Maps sound pressure or sound intensity using an array of microphone or intensity probe. Maps are drawn over an image of the test piece and can be shown as contour and color maps. Measures human response according ISO, DIN and EEC Standards. Includes building vibration, whole body, hand arm, ship vibration, vibration dose, SEAT vibration and vehicle crash biomechanics. The Hammer Impact Analysis guides the user through the process of making the measurements. A pre-test Wizard assists the user in setting up trigger levels and response window weighting factors. Auto reject double impacts and overloads are provided to make the measurement very userfriendly. Use Structural Animation with either frequency data or time data to visualize the vibration patterns. Allows insight into the way the structure is vibrating or the sound pressure distribution of 3-D test object. The software guides the user throughout the entire process. These measurements enable influence coefficients to be calculated. A least squares optimized multi-plane balancing algorithm using a single value decomposition algorithm (SVD) with an option to add bias forms the mathematical heart of the software. The DATS Psychoacoustics Analysis Suite provides a host of functions for the objective description of subjective sounds including loudness, sharpness, roughness, fluctuation strenght and prominence ratio. Includes transfer path analysis, source contribution analysis, path contribution ranking. Help to locate which source is contributing most sound and vibration issues; and which path is most critical. In the Time-Frequency Analysis package, Prosig have been able to implement a number of different algorithms including Wigner Ville, Atlas Zhao Marks and Born Jordan, which all give slightly different emphasis to features of the signal. This package also includes a comprehensive suite of wavelet analysis tools. The Fatigue Analysis package provides a comprehensive set of programs for the fatigue test engineer including rainflow count, life prediction, stress & weld life, strain life, S-N curve and E-N curve and material database & editor.